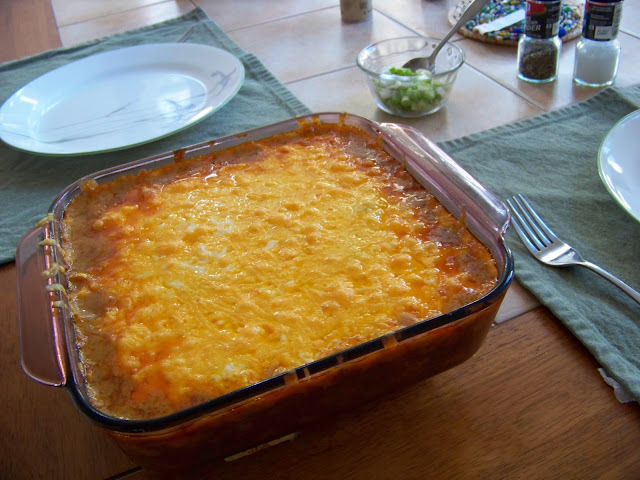 Every family has one of these, a recipe which some members hate and others love. Just kidding. 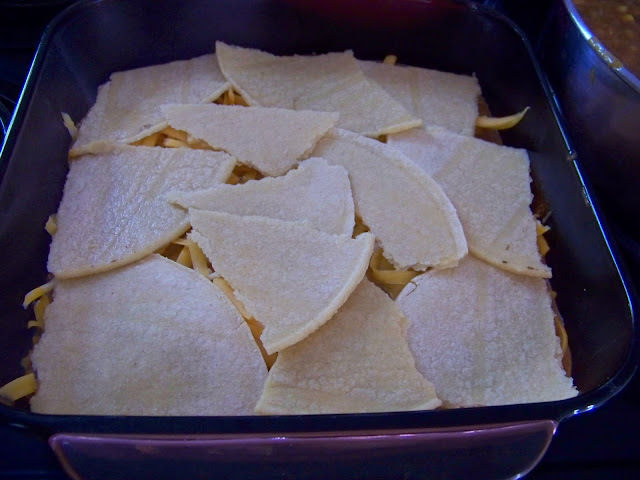 This is a dish I was introduced to by my mother in law. She's made it for years, ever since her daughter brought the recipe home after making it in a Home Economics class. It's been a standby dish in the family for over 40 years. So you know it's undergone the test of time. It's easy to throw together, kid friendly, and you can stretch it, all in all, a win win recipe. This is one I don't mess around with, tweaking it that is, because every time I make it, it is supposed to taste right. Although, you could add beans to it, if you wanted to. When this is served at my MIL's house, it disappears fast. Come to think of it, that happens at my house too. then a can of Mexicorn, next, dump in a can of Enchilada sauce and a can of Cream of Mushroom soup. 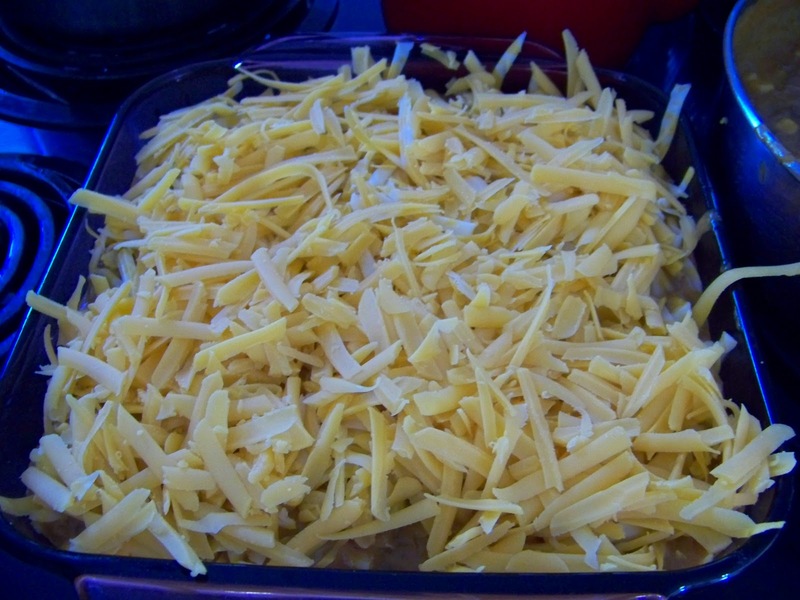 then another layer of corn tortillas, the rest of the meat mixture and top with another cup or two of shredded cheese. Pop into a 350 deg. oven for about 20 minutes or until the cheese melts, pull out of the oven and sprinkle with some black olives and sliced green onions for garnish and serve. 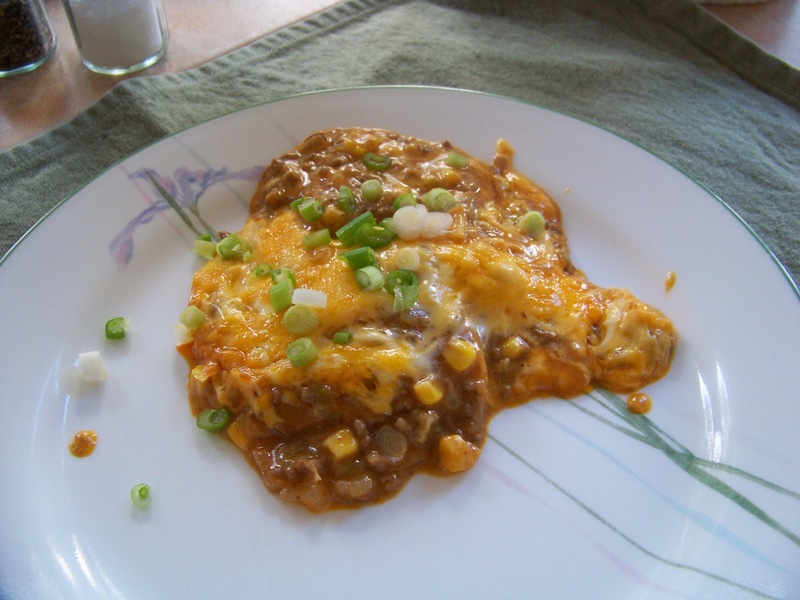 This dish is kid friendly and husband approved. Garnish with some chopped green onions and black olives at the end. 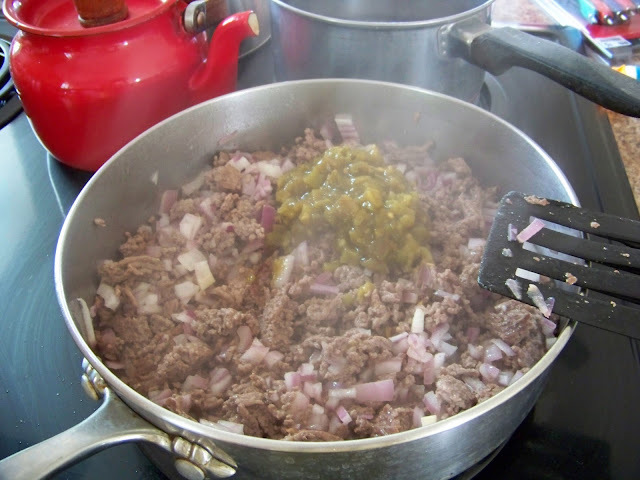 Brown ground beef and onion and when browned add can of enchilada sauce, can of mushroom soup, can of corn and simmer together for a few minutes. 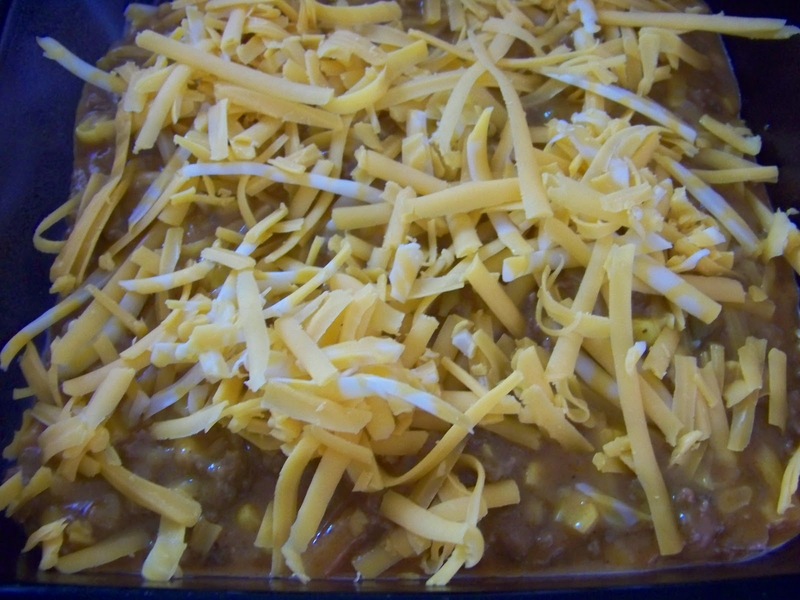 Line a 9x13 pan with corn tortillas, add half the meat mixture, sprinkle with grated cheese, and then place about 4 corn tortillas, torn up over mixture and add the other half of the beef mixture and top with cheddar cheese. Place in 350 deg. oven and bake for about 20 minutes or so. Take out of oven, let sit for about 10 minutes, then sprinkle top with some black olives and cut up green onions for garnish. this looks very delish. My mother makes something similar. 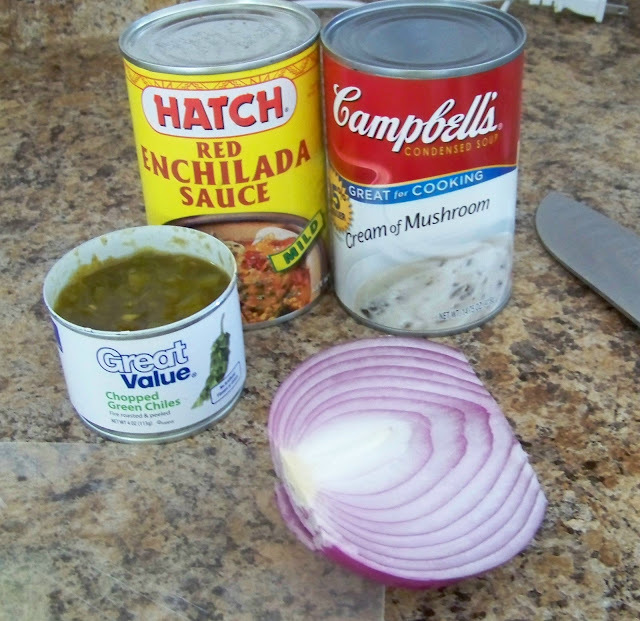 she doesn't add enchilada sauce. I will have to try it. thanks for sharing.